London, 26 September 2012: Chinoiserie at Jumeirah Carlton Tower continues its partnership with Eric Lanlard by unveiling its new ‘I Love Paris’ afternoon tea. The tantalising menu, inspired by the master patissier’s favourite city, is the third instalment in the ‘Afternoon Tea by Eric Lanlard’ series. The experience begins with savoury delights such as brioche filled with pâté de foie gras, lemon and poppy seed smoked salmon macaroon and mini quiche lorraine. Then, to satisfy sweet-toothed aficionados, a selection of cakes and pastries including Le Magnum, a dark chocolate mousse based on the famous ice cream, and Crème Brûlée Tonka, a bean infused dessert topped with caramelised demerara sugar and fresh raspberries. Customers defeated by their tea will be treated to a ‘Take Home Box’ of leftovers on departure, ensuring tea-lovers can take the enjoyment of this experience home with them. As one of the world’s most renowned patissiers and star of Channel 4’s Baking Mad series, Eric has amassed a global fan base and a dedicated celebrity following. Chinoiserie at Jumeirah Carlton Tower provides the perfect backdrop for afternoon tea with its sophisticated, classic-contemporary décor. 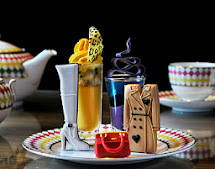 A new twist on the ‘Afternoon Tea by Eric Lanlard’ series will be presented seasonally throughout 2012-2013 for hotel guests and visitors to enjoy. Afternoon Tea by Eric Lanlard costs £40 per person or £45 per person with a glass of champagne, excluding service charge.